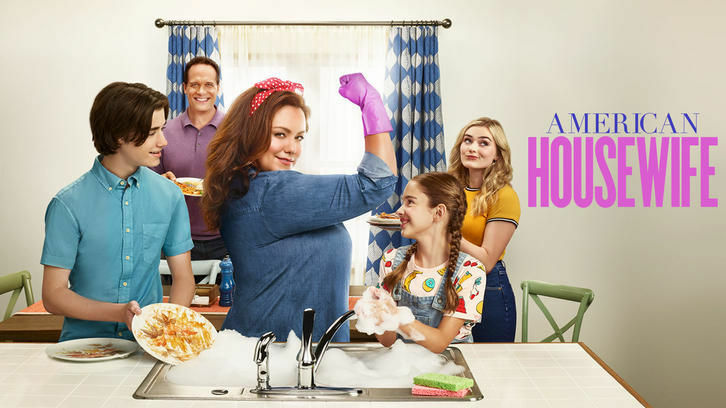 American Housewife - Disconnected - Review: "You Hitting Me Up For a Kidney?" This week on American Housewife, Katie and Greg strive to reconnect with their older kids. And Anna-Kat? She's not so sure how she feels about that. Katie and Greg both realize that their respective relationships with Taylor and Oliver are starting to be fairly dismal. Taylor wants Katie to buy her a new pair of open-toed boots for trying hard in school like Katie's asked her to. All Oliver is focused on is attending his self-help hero Johnny Diamond's latest seminar, so when Greg wants to spend some time together building Luther a new doghouse, he's not interested. Greg, Doris, and Angela all advise Katie to take Taylor on a mother-daughter date to try and reconnect, even if that date is going to the store to buy the opened-toed boots. 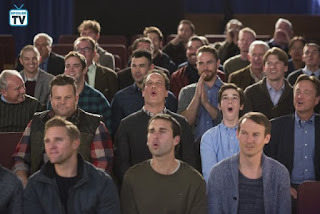 Katie advises Greg to go with Oliver to the Johnny Diamond seminar in an attempt to reconnect with him. Katie and Greg set out on their respective missions. 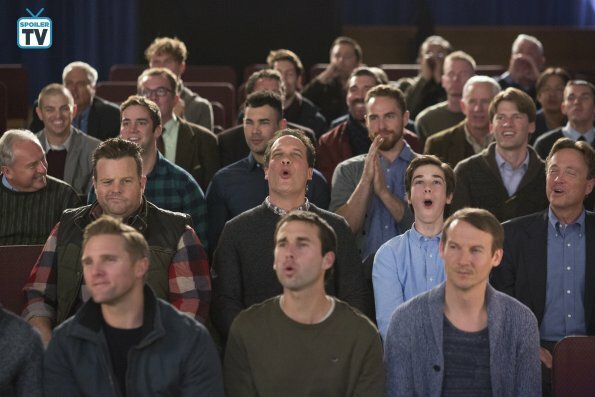 Greg goes with Oliver to the seminar, which turns out to just be a bunch of weird white dudes howling about "maximizing their relationships." Nevertheless, it causes Greg and Oliver to start bonding (as well as spend way too much money on Johnny Diamond merch!) They decide to build the doghouse together. Katie takes Taylor to buy the boots (and ends up buying a pair herself!) and the two have lunch together. It seems like the teens and their parents are finally starting to bond, until...Katie messes it up. Wanting Taylor to talk to her the same way she talks to her friends, Katie tells her a wild story of her own high school days about dating two brothers at the same time. She was busted by one brother when she went off campus with the other brother to smoke. Surprised that Katie has non-nonchalantly mentioned she smoked in high school, Taylor mentions that she tried vaping over the summer. And suddenly, the let's-talk-like-gal-pals idea is off the table and Katie is freaking out over Taylor's actions. Meanwhile, Anna-Kat is advised by her BFF Franklin, in one of his brief moments of non-loony-ness, that since Greg and Katie are taking measures to reconnect with Taylor and Oliver, she needs to do something drastic to secure her place as the favorite child. As she and Franklin go over her talents that can assure she keeps her spot as the favorite (She can't cook. She can't tell the future! ), they hit on a possibility. Franklin says that if she can learn a dirty joke, she can secure her place as the beloved funny one of the family because adults love dirty jokes. Realizing she might need to take some of her own advice, Katie apologizes to Taylor for freaking out but says she'll always be her mom and she'll always want to stop her from making bad choices. She tells her that even though she's still going to be the one to come down hard on her for bad decisions, she'll always be there for her when she really needs her. Finally, Anna-Kat tries out her new joke. And even though the actual words are played over by music, it's obvious from her numerous hand motions that the joke is seriously X-rated. Horrified (but also secretly slightly amused at the joke) Greg and Katie ask her what's gotten into her. She explains that she wants to make sure she stays the favorite child now that she's getting older. Katie tells her that she'll always be the baby of the family, and that, by default, that means she'll always be the favorite. But she's still grounded for the joke. And some parental controls are going on the tablet, stat! -Was anyone else laughing out loud when Katie was trying to walk in the open-toed boots? Do you think Katie and Greg will continue to be able to improve their relationships with Taylor and Oliver? What did you think of Katie's reaction to Taylor's admission? Let me know below!